The Rainbow Travellers Tarot is an original Limited Edition magical tarot deck woven with beautifully expressive imagery in which each of the 78 cards has its own story to tell. We are all travellers in this lifetime and are often seeking answers to the many questions regarding our existence/purpose and experiences. These border-less cards are 3×5 inches in size making them easy to handle and shuffle. The 22 cards of the major arcana contain a unique spin on some of the traditional symbols. 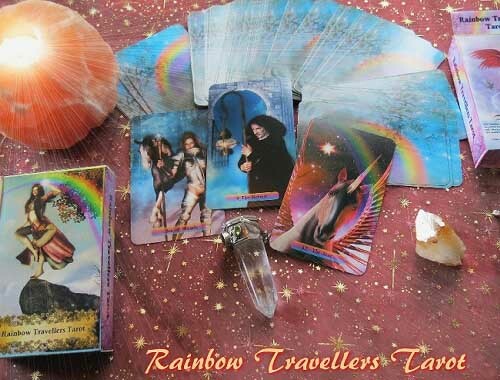 The Rainbow Travellers deck goes beyond the here and now and calls upon the mystics that whisper to us with insights that serves our higher purpose. They are a tool to connect with your inner wisdom, intuition and guides. Pamela said, “Carmen, the Rainbow Travellers is sitting in front of me right now. It looks and feels amazing. From the card stock, to the actual printing it’s a mystical energy that leads into the deck rather than being dragged. Each image is a new experience in tarot. Your insights and unique perspective is both refreshing and delightful. I do truly love your Rainbow Travellers”. Pamela Steele is the artist and author of the Steele Wizard Tarot, and along with four decades of art experience and over 30 years tarot reading Pamela is a mentor to many new deck creators and enthusiasts. Dan’s comments on using the Rainbow Travellers Tarot, “Having used several styles of decks in the past and read about dozens more I can say that Carmen has managed to capture a modern yet traditional interpretation of the Tarot decks core meaning with her Rainbow Travellers Deck. The imagery she has chosen to portray is provocative and new age, while at the same time bringing out the core value each card would traditionally represent”. Dan Mullins is a tarot enthusiast who has studied the tarot since his teens. Trained as a Wiccan priest, Dan has studied many forms of divination and spirituality. Bonnie says, “The Rainbow Travellers Tarot” is a stunning deck – gentle, with modern imagery, and a “WOW!” quality to each of the cards. The inspiration for this deck came from the deck creators earlier work with mythical and fantasy images.” Bonnie Cehovet is a Certified Tarot Grand Master, a professional Tarot reader with over fifteen years experience, a Reiki Master/Teacher and a writer. Tara: The deck arrived much quicker than I thought, especially coming from Canada. Absolutely beautiful cards. I’m giving them as a gift, but I kind of wish I had some for myself! I can’t wait to see the expressiong on my friend’s face when she sees this magnificent deck. Lucia: This is a magical and radiant deck.